Series: These series are developed to handle extremely corrosive liquids such as acids and alkalies etc. These seals are mounted externally with replaceable seal face. Different seal materials are available according to applications. SSE 10 series mechanical seal is externally mounted PTFE bellow seals, which are available in various variety for different pumping media on varying parameters, they are designed for extremely corrosive fluid and in severe condition, capable of working in uneven concentrations of organic substance, acids, salt. We take pleasure to introduce ourselves as one of the renowned firms for providing the best-in-class range of PTFE Bellow Mechanical Seal. 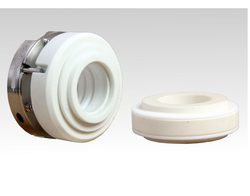 Expert Engineering, an ISO 9001: 2008 certified company, manufactures a wide spectrum of PTFE Bellow Seals.